Yesterday we delivered the woodland creatures to Woodland Trust's newest wood Heartwood, near St Albans. There was the first tree-planting event happening at the wood and there were local dignitaries and volunteers attending. We chatted with the Mayor of St Albans and listened to the speech by the director of The Woodland Trust. The speech was very inspiring and reminded us that we have planted many thousands of willow trees during the life of Willowpool Designs. The willow animals will be treated with linseed oil and then installed around a woodland trail at Heartwood. 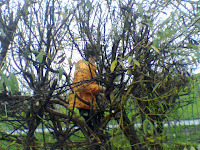 Today Ryan and I had to harvest willow in the wind and rain in readiness for our jobs in Liverpool, Newcastle and Chorley. We cut and bundled about 800 giant willow rods in about 2 hours. We have nearly finished the maze at Whale Hill. Amazingly we have not been rained on at all during the construction of the maze despite grey skies every day and very strong winds. We only saw rain when we drove back to Cumbria tonight when it was very wet. We have one more day at Whale Hill in December when we will plant some different willow varieties in the maze and generally tidy up. 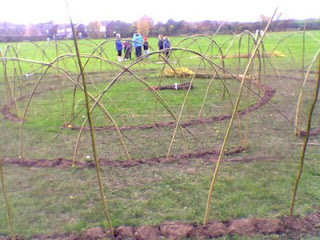 Mazes are probably the most physically challenging living willow sculptures to make as there are so many planting holes to make even with the children helping. despite suffering from the flu we have had to continue making the woodland creatures for the Woodland Trust to be installed at their new Heartwood in Hertfordshire. Steve has been working on an owl and a squirrel. Its very hard to weave a good likeness. Simone has been working on Broc the Badger and its looking very good. We are having to work in our conservatory and the rain is pounding on the glass but we are happy listening to Waulk Electric on our minidisc player. We have been working at Whale Hill, near Middlesborough this week. We avoided the rain and floods of Cumbria and stayed in Saltburn-by-the-sea. The weather was very windy and overcast but not the torrential rain of Cumbria. We worked with years 5 & 6 to start marking out the maze. Despite suffering from flu we struggled on all week and ewven visited the seaside at Redcar. We will have to spend the weekend recovering in bed drinking honey and lemon and sucking throat sweets. Willow Pool Baskets began as 'Hedgerow Baskets' in 1979. Steve Fuller was initially taught by John Rome, a Cumbrian farmer who was a noted basketmaker who grew his own willow and specialised in fishing creels. Willow basketry has a strong tradition in the border regions of Cumbria and Dumfriesshire. John Rome was taught by his uncle, and local farms used to be supplied with 'swill baskets' [frame baskets for harvesting potatoes, feeding livestock etc] by itinerant craftsmen using willow and hazel from local woods and riverbanks. I aim to continue the tradition of sturdy, durable country baskets for a variety of uses and also will be offering some baskets made of recycled contemporary material.I am also interested in using living willow for environmental sculpture such as tunnels and mazes, and can advise or assist on living history/countryside/environmental projects. I welcome enquiries for repair and restoration/reconstruction work. I can also advise on willow cultivation and obtain cuttings for planting. Demonstrations, workshops, talks etc can be arranged for schools, museums, art centres and countryside venues. Some of my past events have been at Tullie House [Carlisle], Durham Dales Centre [Stanhope], Bluecoat Display Centre [Liverpool], Carlisle Castle, Primervera (Cambridge),Althorp [Northhampton], Bede Museum [Jarrow], Woodland Event [East Cumbria Countryside Project], Tweeddale Museum [Peebles], Seatoller Barn [Keswick] and the Great North Forest (Tyne and Wear/Durham). * Please note that Carriage is extra. We are loading the van with willow for the Living Willow Maze at Eston, Middlesborough. The construction begin tomorrow morning with groups of year 6 children. They will be doing the initial digging to form the shape of the maze. Its nice an sunny here in Kendal at the moment after much torrential rain so now is the time to get the will loaded on the roof. Our good news is that Simone passed her ‘Life In The UK’ test that she had to take in order to get a UK passport. This is despite having lived here for nearly 30 years, owning a house here, having 2 children educated to degree level here, paying taxes here and running a business here. Now we have to find nearly £1000 to actually get the passport. We are working at Grange Primary for 3 days this week. We have built a living willow tunnel in the Surestart Garden and are building a dome and a tunnel in the Reception garden. We have worked at Grange on several projects over the years and the living willow domes in the main playground look fantastic. We built these domes about 6 years ago as part of the Sefton Living Shade Project. We returned 3 years ago to overhaul the domes and since then the site manager has done a great job of looking after them ie pruning and weaving in. The weather was fine for the morning but began clouding over at lunchtime. We decided to go and cut some willow in Maghul after finishing at the school and by the time we had cut several bundles the heavens opened and there was a massive downpour. Luckily the rain had stooped when we got to Endmoor and had to unload the van. We worked with the Reception children at Garston on Monday. 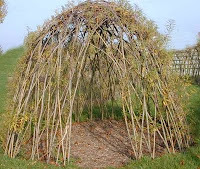 We built a living willow dome in the nursery area. The children were lovely, very chatty and interested in the construction of their dome. Simone made everyone a willow star to take home and a living willow heart to grow in the classroom. We had been to this school in the spring and made a long lattice-work living willow fence. It looks great but there is no sign of growth. However we saw that the length of the fence had been treated with weedkiller and suspect that the weedkiller killed off the willow rods. We will return later this winter to do a repair job on the fence by planting new cuttings and leaving strict instructions that gardening contractors should keep away from the fence! We worked at Bedford Modern School on Saturday. We helped 6th form students to design and create sculptures based on fruit and vegetables in the garden. There were some great sculptures made including a giant mushroom, an apple and an onion. Today we were at Whale Hill Primary School, Eston nr Middlesborough. 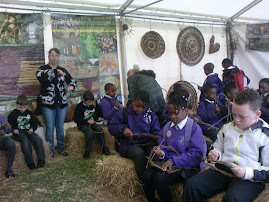 We had an introductory day with the children prior to making a large living willow maze. We took part in a special assembly to tell the children all about willow and how they can use their completed maze for both study and play. In the afternoon we marked out the maze in readiness for the children to do their digging and planting tasks next week. Simone has decided to finally take the plunge and become a British citizen after nearly 30 years of being an American in Cumbria. This is much more complicated than we had thought and Simone has to take a 'Life in the UK' test! I can't answer many of the questions on the 'helpful' booklet supplied by HMSO. Many of the questions seem to be quite obscure. I was hoping that they would be along the lines of 'Why is Big Brother so Boring?, 'who is Dr Who?' etc. Earlier this week we spent a day with some students from Year Groups 9 and 10 at Furness Academy, Barrow. The project was an 'apprentice' type challenge for the students as part of their Enterprise module. We worked with 2 different groups and showed them some basic willow weaving ideas and suggested ways of marketing the items that they would make. We also suggested ways of supplementing their supplies of material and how to increase the value of handmade items. The plan is for each group to create and market some willow items in whatever ways they feel to be appropriate. As on the tv programme The Apprentice to group making the most profit wins the contest. The children are excited by this challenge and are already coming up with some interesting ideas. We are doing some willow repairs today. we are at Stavely C of E Primary School and Christchurch Primary School, Carnforth. According to his surname, Steve Fuller should be carrying on his family's ancestral trade of cloth fulling. But several years ago, when he and his wife moved to Longtown near Carlisle in the Lake District, he turned to dairying to make a living. Soon afterwards, Fuller took a locally offered basketmaking course and turned from what ancestry and necessity had previously demanded. He liked making baskets and decided to become a craftsman. An old farmer, John Rome, taught the basketry course and was pleased that Fuller took such an interest. Although willow basket making is a traditional craft in the Longtown area, few young people are willing to learn it and carry it on. When the dairy farm where he was working was sold, Fuller was left without a full-time job. He decided to turn his hobby into a business, and Hedgerow Baskets was born. After several years of making and selling baskets from his cottage, Fuller began taking part in crafts fairs in the Lake District and Scotland. A craft store in Caithness, Scotland bought his baskets and it, in turn, made a sale to Queen Elizabeth, The Queen Mother. Now, Fuller says jokingly, he dreams of seeing the Royal crest and 'by appointment to H.M. Queen Elizabeth The Queen Mother' emblazoned above his shop. Royalty aside, Steve Fuller's baskets are special. He starts with good quality English willow that is grown and harvested for him in Somerset. 'I can't do the growing and the harvesting and the basket-making. It's all too labour-intensive,' he claims. He does, however, use some of the willow from his garden. The willow comes in three natural colours. Brown willow still has the natural bark. White willow has had the bark peeled off. And the buff colour results from the willow being boiled with the bark on; the tannin in the bark dyes the willow a soft brown. With only a knife and a pair of cutters, Fuller begins a basket by making the base first. He weaves the different strands of willow into a traditional design, and gradually he builds up the sides, sometimes adding a decorative border of three colours near the rim. Lastly, he weaves and attaches the handle. At least two hours are spent on every basket. The countryside around him is also an inspiration. 'I take my dog for walks into Scotland. The border is not far from my cottage and I love to get out and walk,' Fuller says. The muted colours of the hills and fellsides, changing in sunlight and cloud, give him ideas for new textures and weavings of colour. This area of Cumbria is the Debatable Land, once hotly contested between England and Scotland. Border reivers once plagued the region before Wordsworth and Coleridge had admired their first daffodils. But some things last. Steve Fuller's baskets are a part of the Lake District that you can keep for many years, and then pass on to the next generation. Royalty aside, Steve Fuller’s baskets are special. He starts with good quality English willow that is grown and harvested for him in Somerset. ‘I can’t do the growing and the harvesting and the basket-making. It’s all too labour-intensive,’ he claims. He does, however, use some of the willow from his garden. The willow comes in three natural colours. Brown willow still has the natural bark. White willow has had the bark peeled off. And the buff colour results from the willow being boiled with the bark on; the tannin in the bark dyes the willow a soft brown. With only a knife and a pair of cutters, Fuller begins a basket by making the base first. He weaves the different strands of willow into a traditional design, and gradually he builds up the sides, sometimes adding a decorative border of three colours near the rim. Lastly, he weaves and attaches the handle. At least two hours are spent on every basket. The countryside around him is also an inspiration. ‘I take my dog for walks into Scotland. The border is not far from my cottage and I love to get out and walk,’ Fuller says. The muted colours of the hills and fellsides, changing in sunlight and cloud, give him ideas for new textures and weavings of colour. This area of Cumbria is the Debatable Land, once hotly contested between England and Scotland. Border reivers once plagued the region before Wordsworth and Coleridge had admired their first daffodils. But some things last. Steve Fuller’s baskets are a part of the Lake District that you can keep for many years, and then pass on to the next generation.